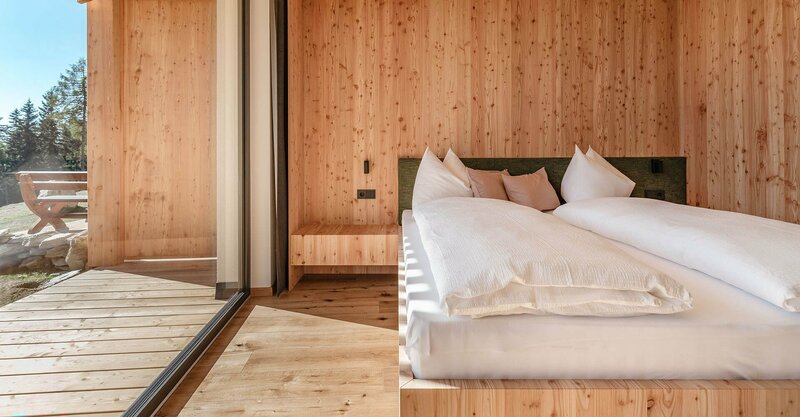 Are you looking for a room close to the peak Cima Lasta on one of the most beautiful alpine pastures in South Tyrol? Then spend your holidays with us in our alpine hotel on the Rodengo-Luson Alp. Our rooms are idyllically situated in pristine nature and completely free of traffic. 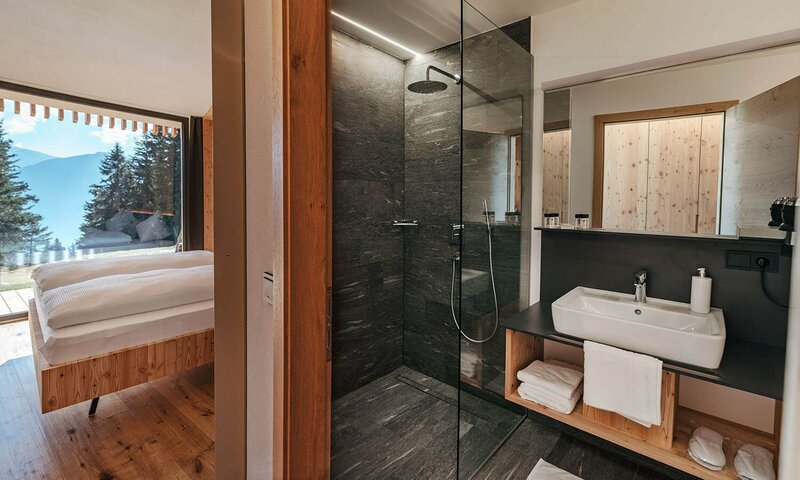 You may choose among seven rooms and three suites, from where you may admire the UNESCO World Heritage Dolomites and our local mountain, the Cima Lasta. 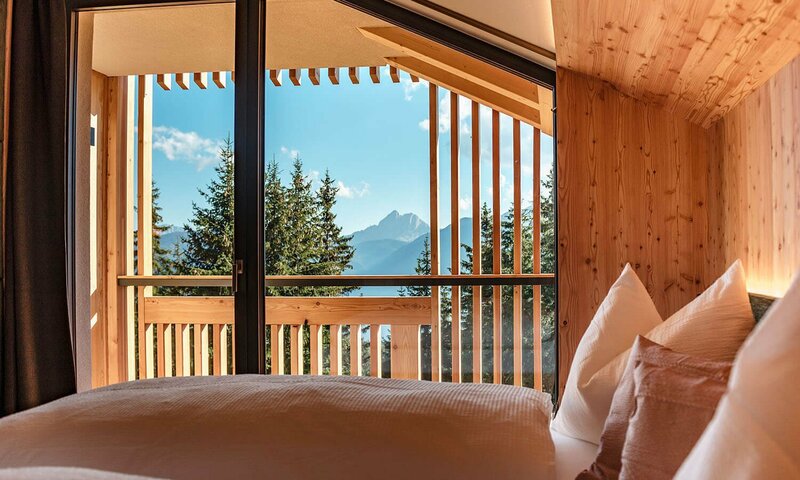 All our rooms feature a private balcony or garden terrace and offer a wonderful panoramic view of the Luson Alp and the Rodengo Alp. 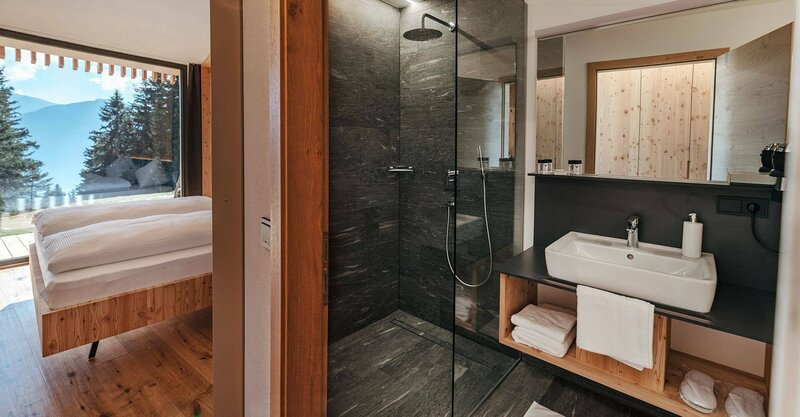 Our rooms on the Luson Alp offer everything you need to feel completely at ease: custom-made, high-quality furniture, a spacious bathroom with a large shower and a hairdryer. Furthermore, our rooms with half-board feature free Wi-Fi and flat-screen TVs. 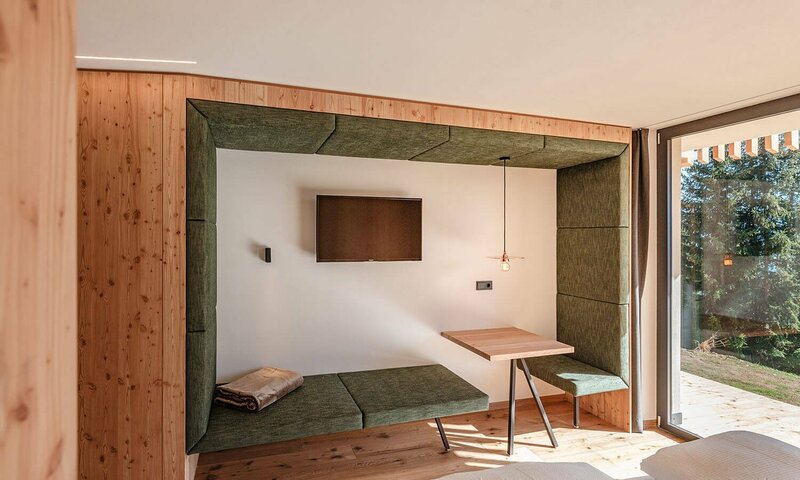 A personal desk, a comfortable sitting bench and table and a safety box complete the modern facilities of your room with views on Sas de Putia. 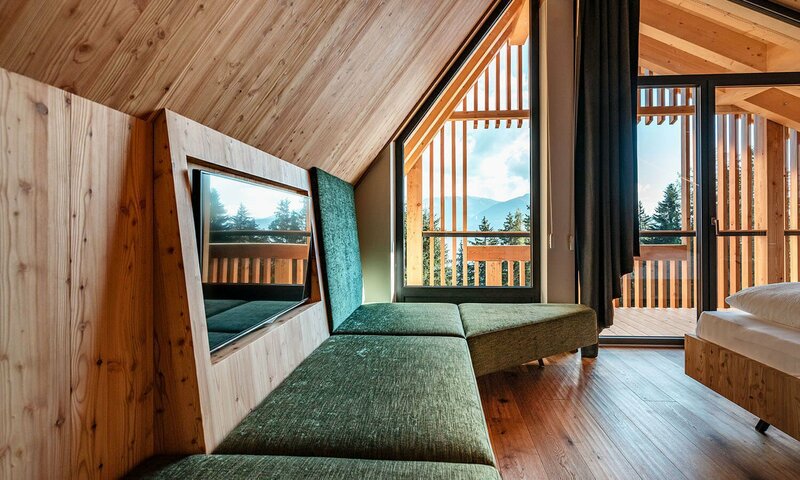 The three suites on our alp await you with very special highlights for luxurious wellness moments in the mountains. 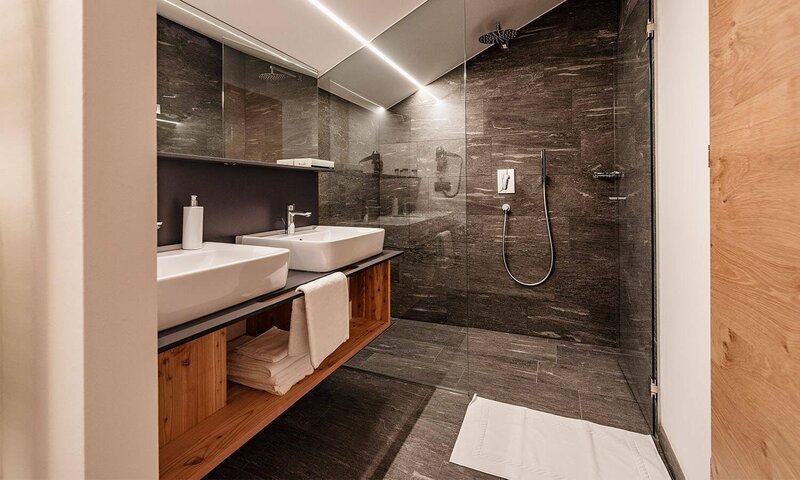 At 1730 m, you may relax while enjoying a sauna and indulge in special moments of pleasure. 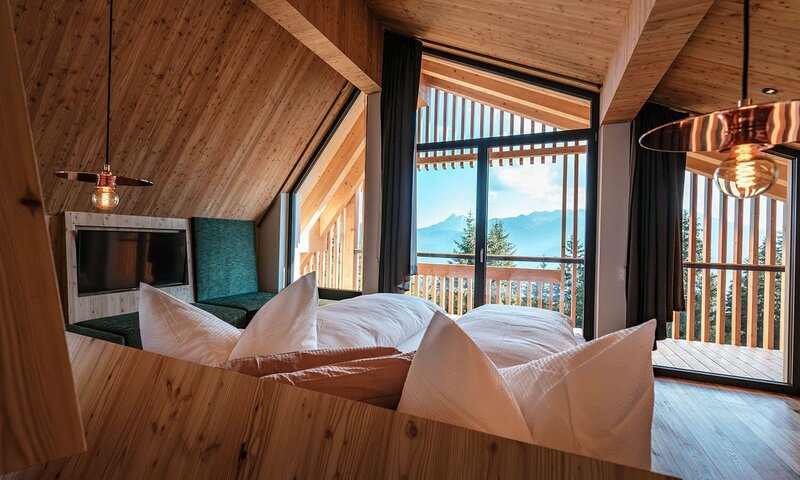 Alpine wellness in one of our exclusive alpine hotel suites is ideal for a romantic holiday. 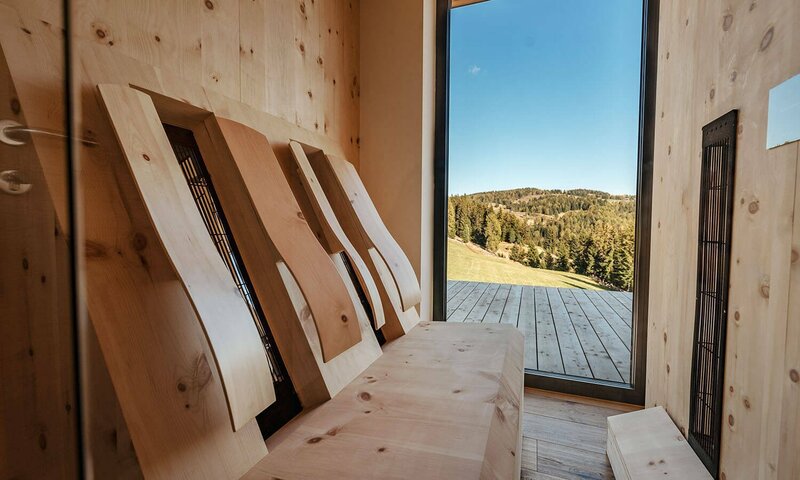 The Cima Lasta Suite and our Luson Alp Suite are equipped with a spacious infrared sauna. 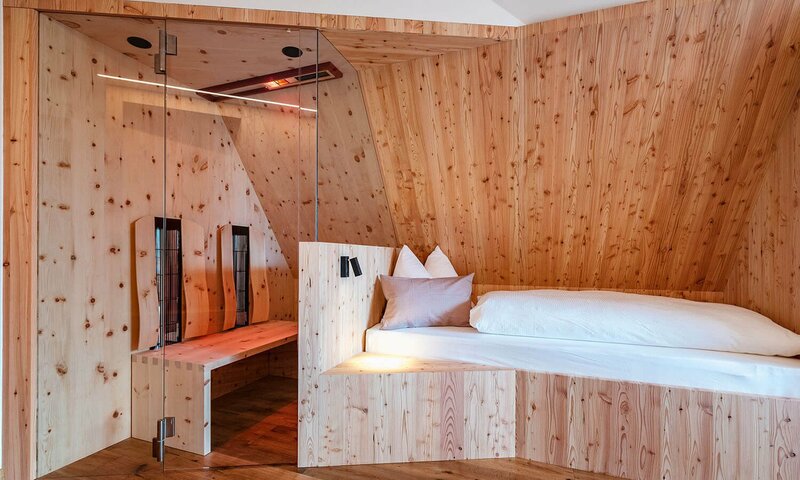 After an exciting day of hiking, you may relax in the infrared cabin and enjoy its healing and soothing effects, preventing muscle and joint pain. The most marvellous nature at your doorstep! 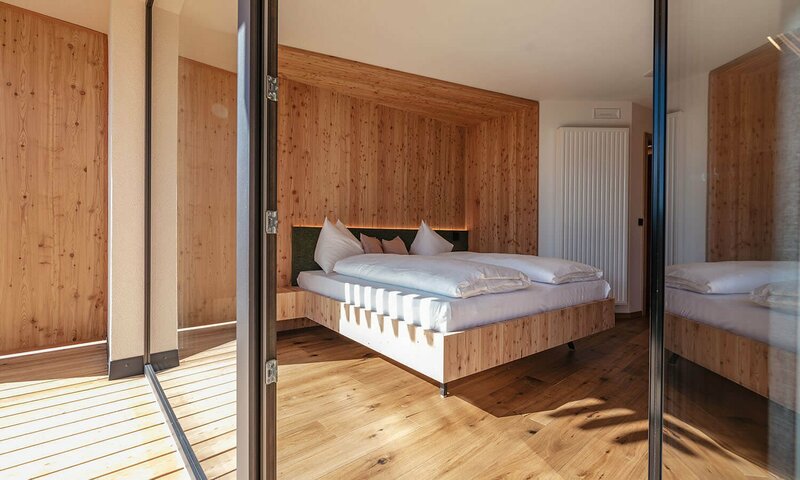 The special feature of the double rooms “Rodengo Alp” (25 m2) are the small garden terraces and the direct access to the outdoor area. From here you may enjoy views of the Rodengo Alp and the Luson Alp, as well as Sas de Putia. Only in these special and very suitable rooms you may bring along your four-legged friend. A local carpentry workshop custom-made the stylish and yet traditional furniture in larch. The high-quality parquet floor is designed in larch as well. A harmonious colour and lighting concept completes the extraordinary pleasant ambiance. The facilities of the spacious double rooms include a coat rack, a luggage rack, a bench with a table, a flat-screen TV and fast internet via Wi-Fi. 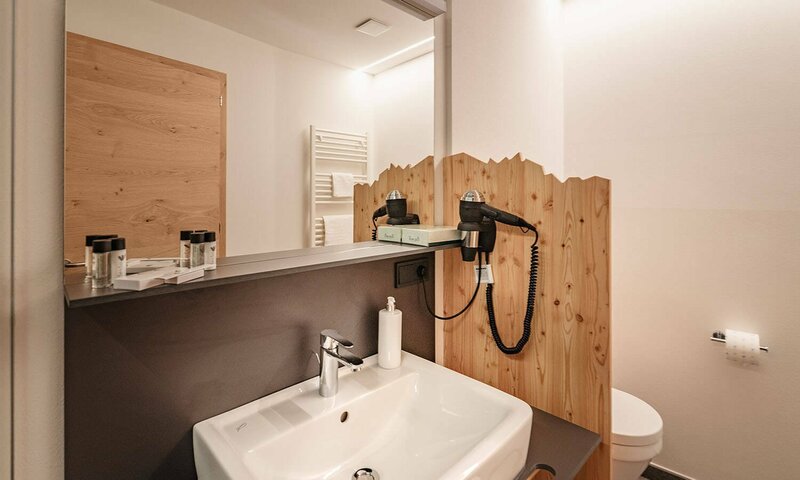 The pleasant bathroom has a shower, WC, bidet, vanity with storage space, hairdryer and a select care series. “Passion for Nature” is also the central theme for our double room “Sas de Putia” (25 m2). 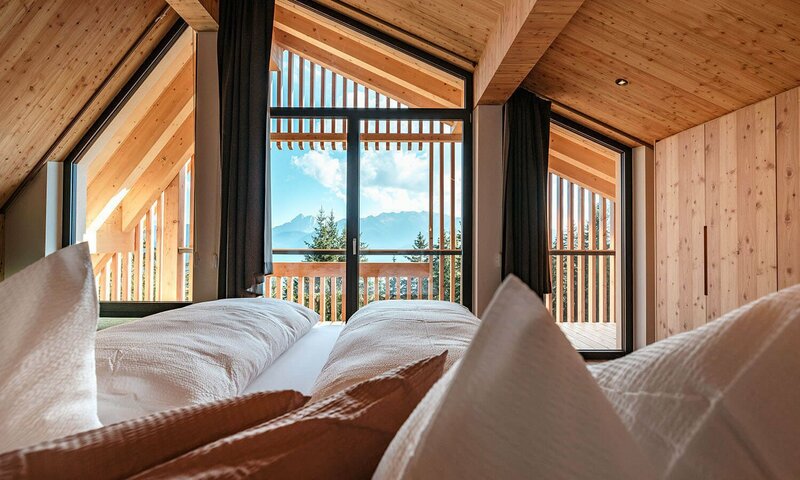 From the spacious south-facing balcony, the view stretches across the Alp of Rodengo and Luson to the Sas de Putia, and as far as the Dolomites. The stylish and at the same time traditional interior design convinces with a high-quality furnishing made by a local carpenter. 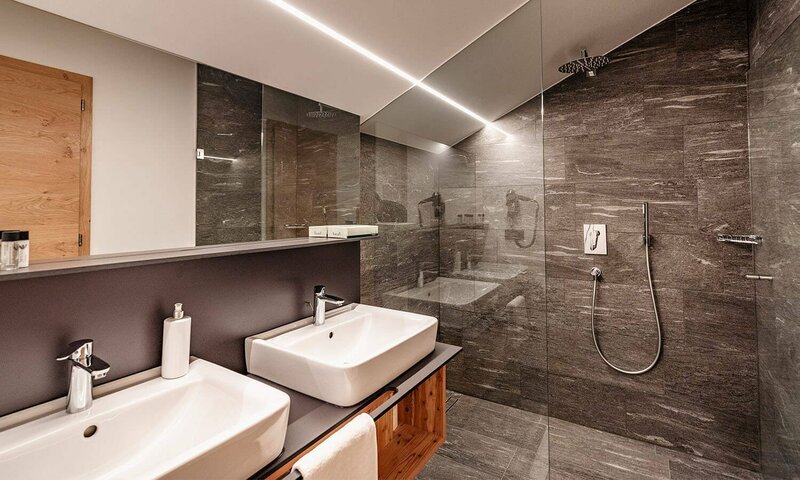 A harmonious colour and lighting concept ensures a harmonious ambiance and cosiness in every season. Not only for guests with allergies, the parquet floor in oak is particularly pleasant. Also, pets are not allowed in these rooms. 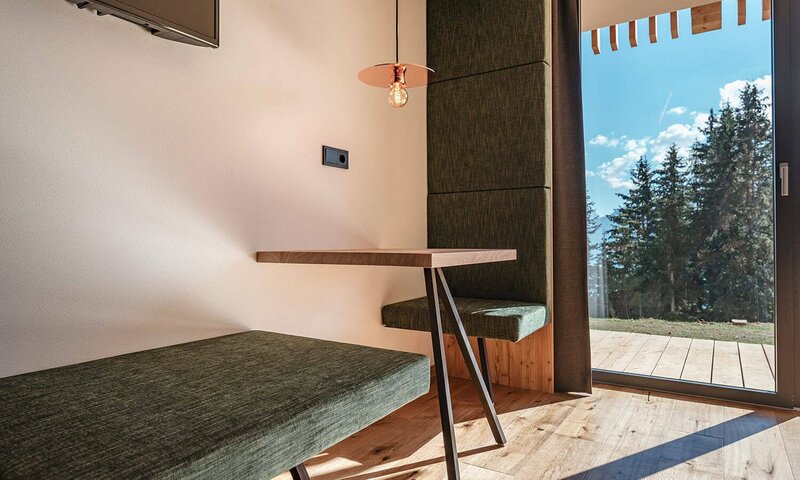 The spacious double rooms include a coat rack, a luggage rack, a bench with a table, a flat-screen TV and – also important in the middle of nature: fast Internet via Wi-Fi. 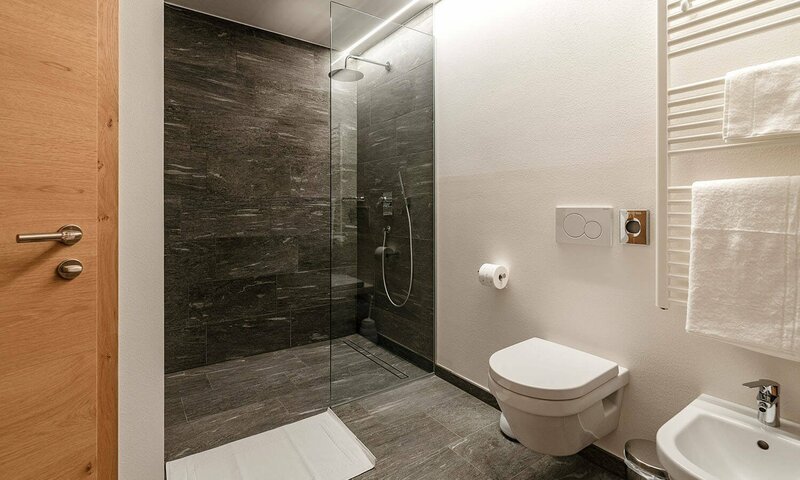 The bathroom has a shower, WC, bidet, vanity with storage area, hairdryer and a select care series. 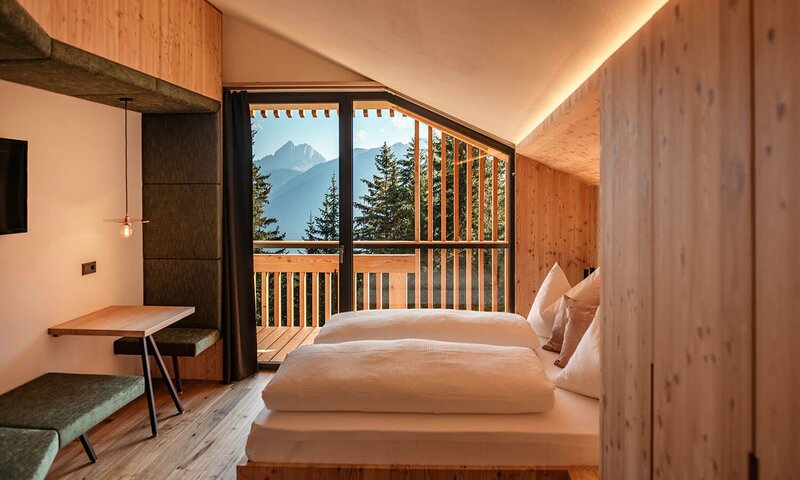 The suite takes its name from the unbelievably marvellous view of mountain meadows, forests and the whole Alpe di Luson, a vista you may enjoy from the huge panoramic window. 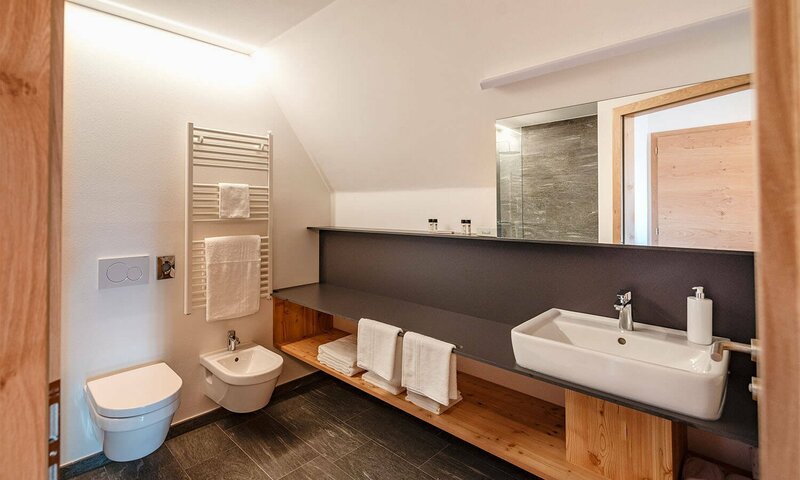 With 34 m2, the Suite “Lüsner Alm” offers you a spacious and particularly comfortable living experience. 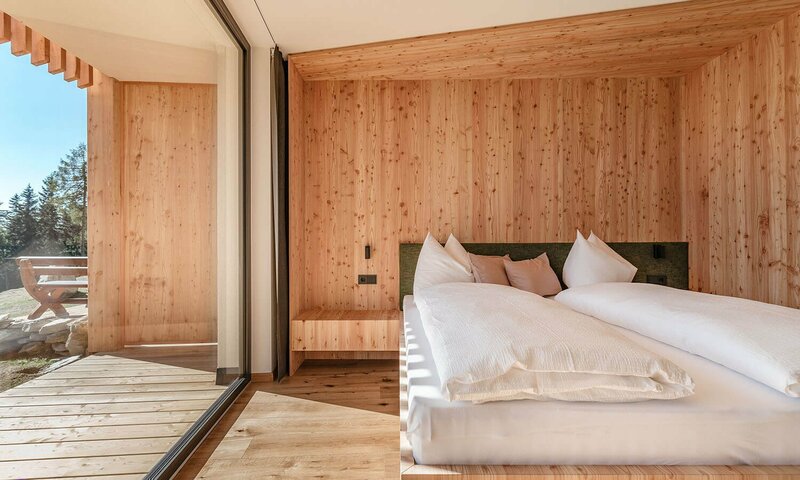 The elegant and yet traditional furnishings in larch wood were tailor-made by a local carpenter. 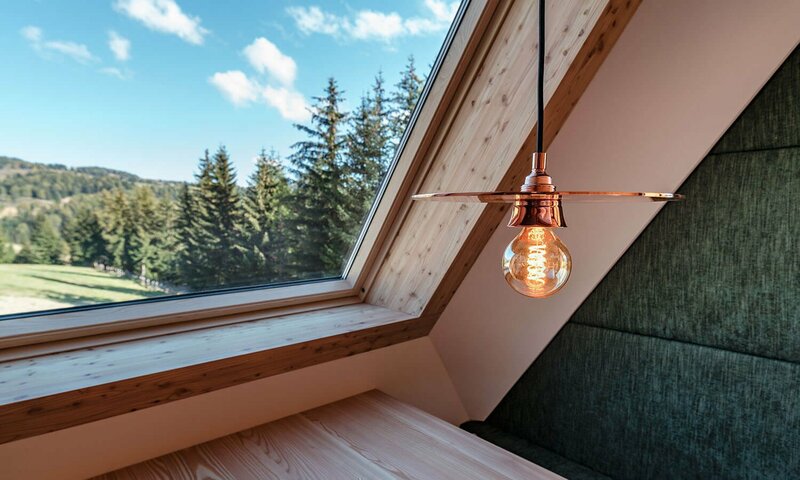 The interiors include a wardrobe, a luggage stand, and a comfortable bench with a table next to the panoramic window, a flat-screen TV and fast Internet via Wi-Fi. 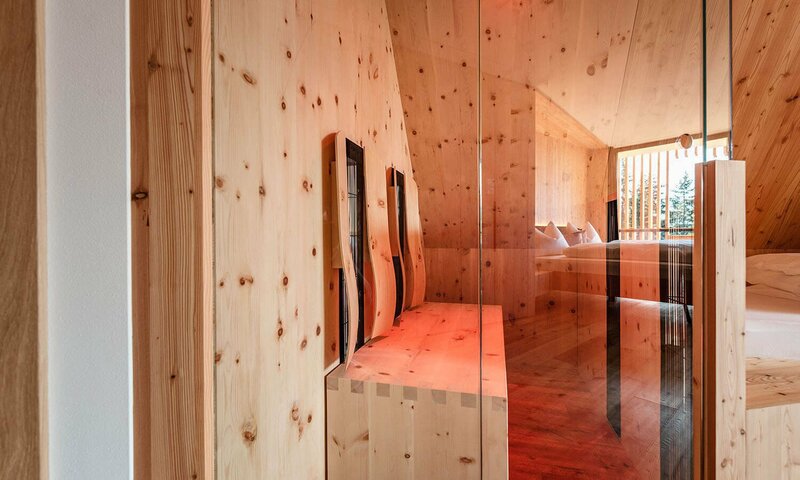 The highlight of the suite is a private infrared sauna. 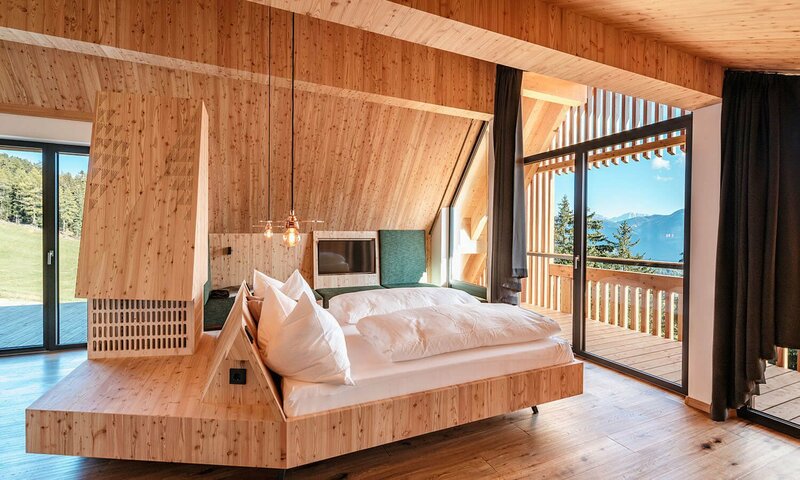 Furthermore, the Suite “Lüsner Alm” has a south-facing balcony overlooking the Sas de Putia, one of the most striking peaks of the Dolomites. 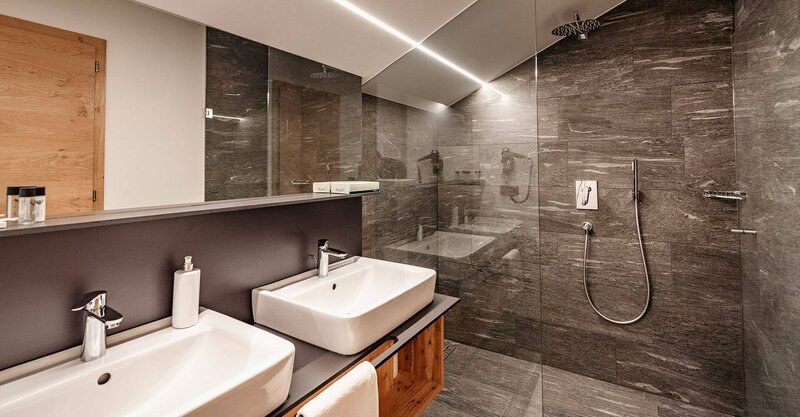 In the spacious bathroom you will find a shower, a toilet, a bidet, a vanity unit with storage space, a hairdryer and a small selection of care products. 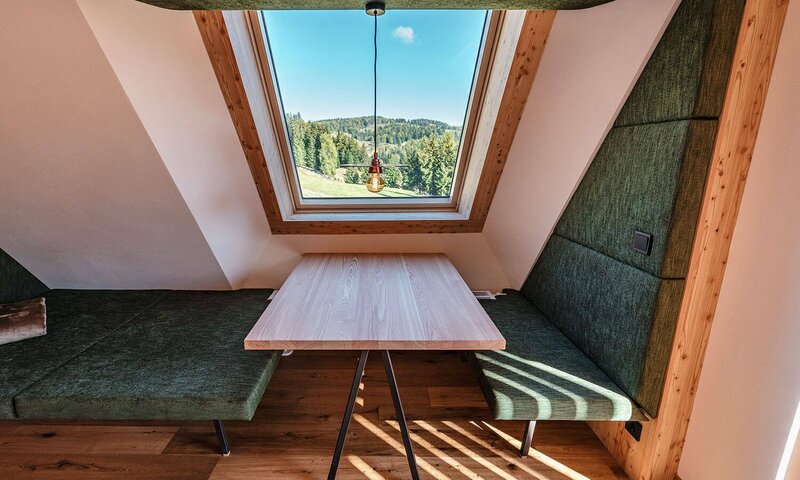 The Suite “Lüsner Alm” can comfortably accommodate up to three persons. 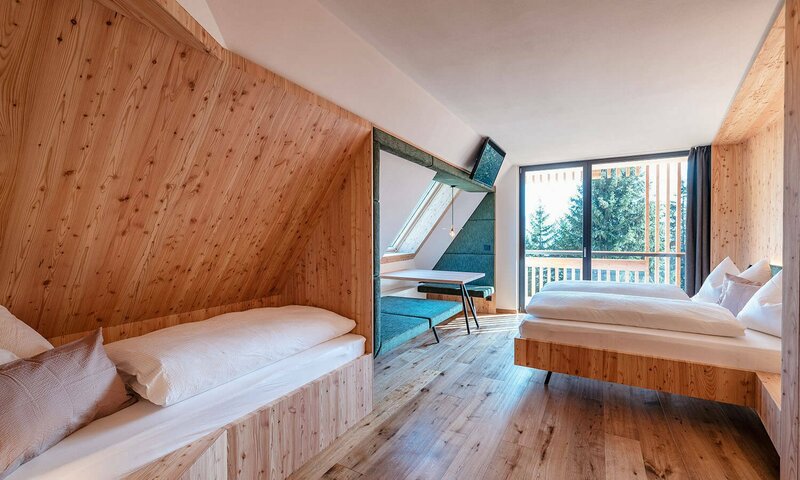 The Suite “Astjoch” is truly gorgeous and extremely comfortable, offering 48 m2 of space. 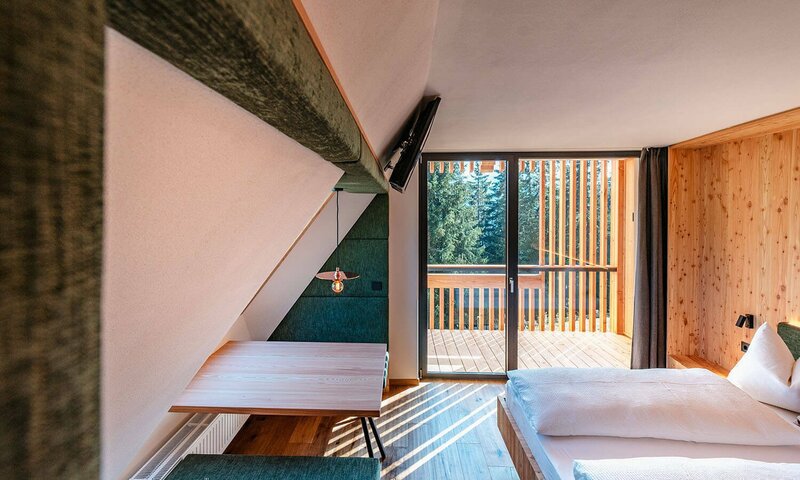 Located on the second (top) floor, this suite has a south-facing balcony as well as a private terrace with 20 meters2, from where your gaze wanders across the Alpe di Luson and Rodengo to the Sas de Putia and into the Dolomites. 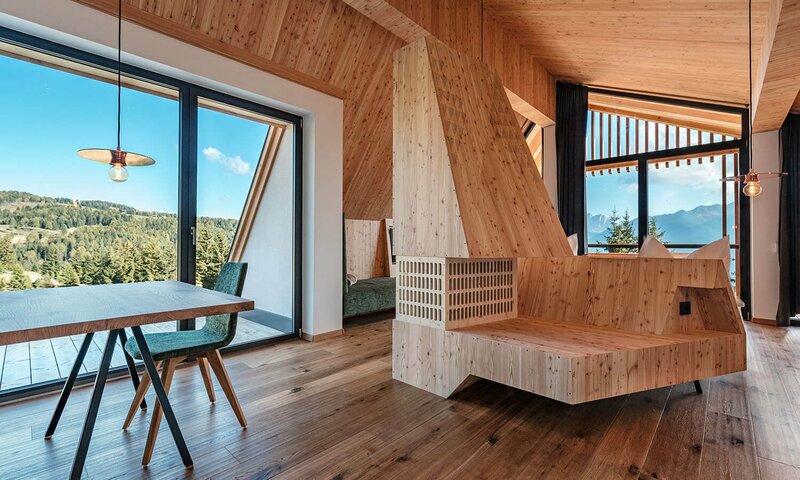 The high-quality, elegant and at the same time traditional larch wood furniture and the parquet floor in oak create an exclusive ambience that leaves nothing to be desired. 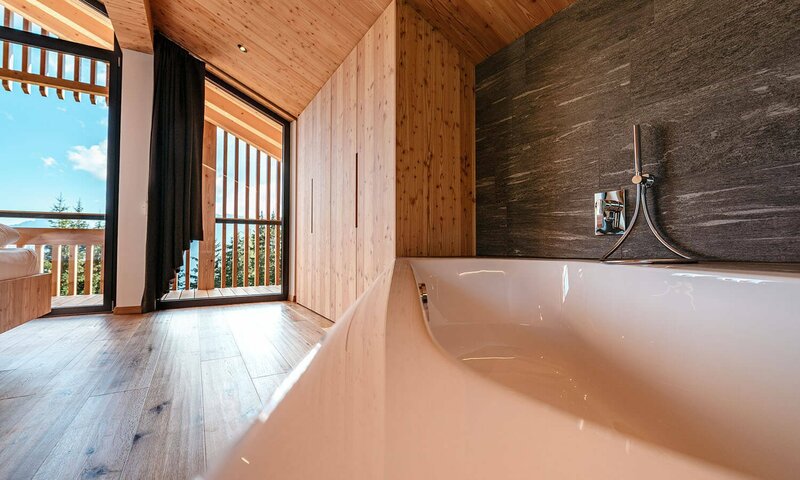 The highlights of this suite are a private panoramic infrared sauna and a bathtub that is integrated into the living area. 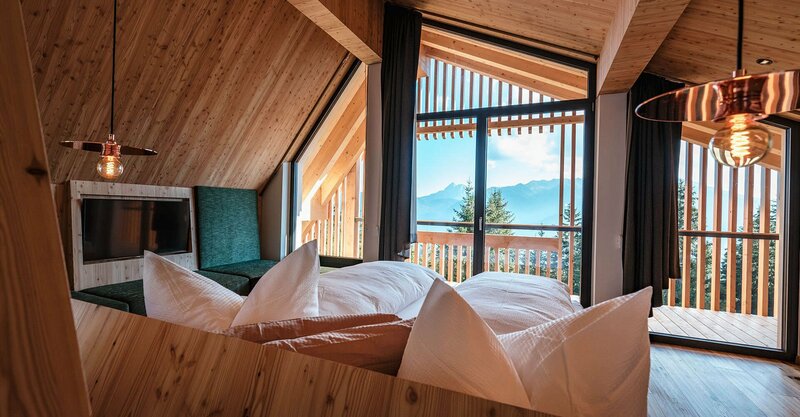 From the large double bed, you may enjoy a magnificent view of the Dolomites. 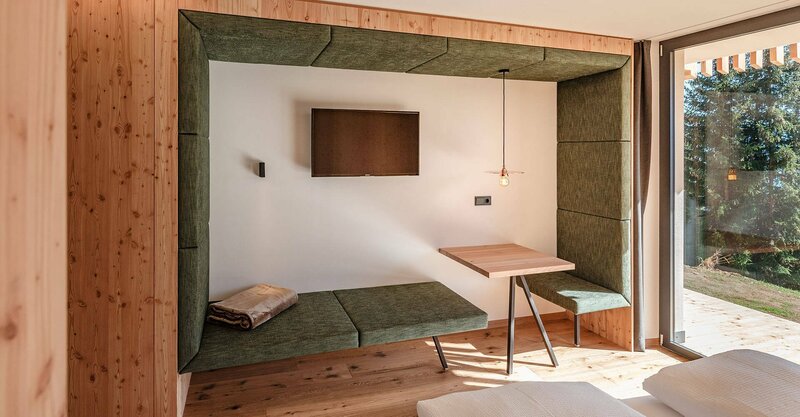 A fluffy sofa and a comfortable bench with a table complete the amenities, which also include a wardrobe, a luggage rack, a flat-screen TV and fast Internet via Wi-Fi. 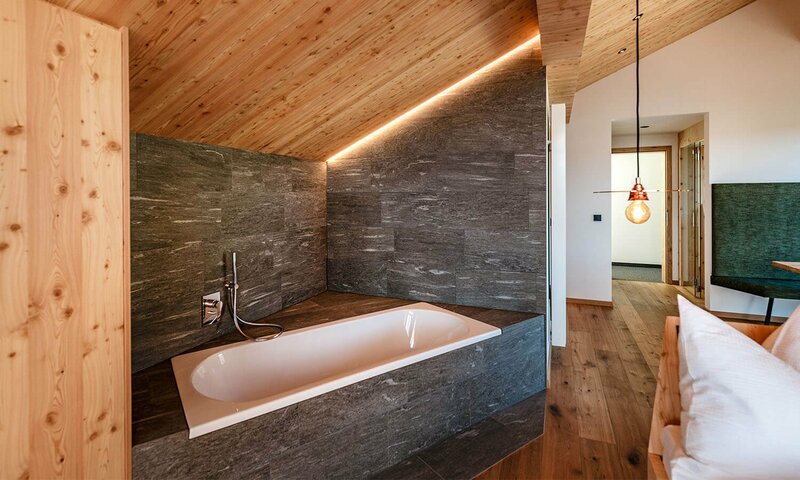 The harmonious colour and lighting concepts guarantee a pleasant atmosphere and cosiness in every season. 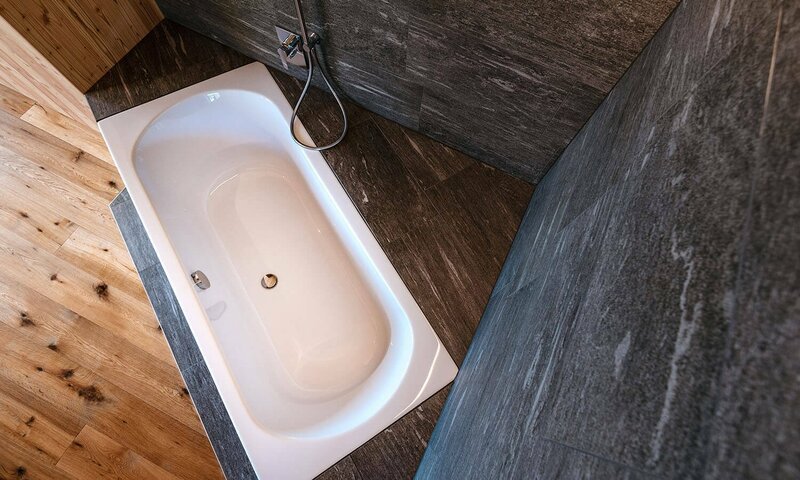 The bathroom has a spacious shower, a toilet, a bidet, plenty of storage space, a hair dryer and a small selection of care products. 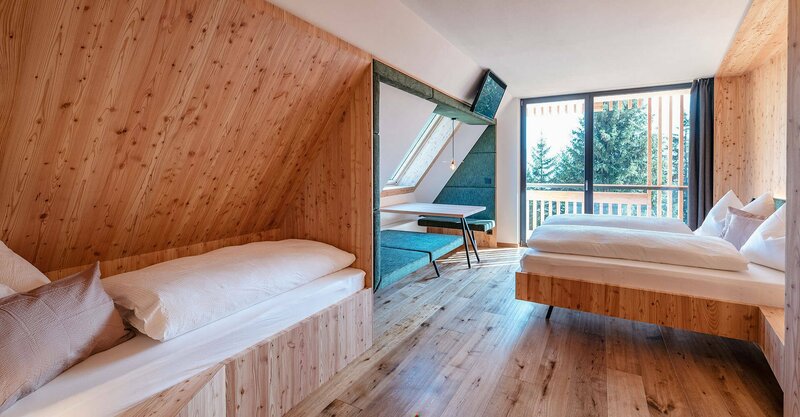 The spacious Suite “Astjoch Suite” is the ideal accommodation for up to 2 persons. David Leitner – kitchen chef – and Thomas Leitner – service manager and wine connoisseur – ensure great food on your plate, a perfect and friendly service, as well as an all-round successful culinary experience. Breakfast buffet with mainly regional products. South Tyrolean bacon (“speck”), quality sausages and fine cheeses from local producers. Homemade bread and baked goods. Quality guaranteed whole milk from the family owned farm. In the summer, vegetables, and salads from our alpine garden. Herbs from your private herb garden. Seasonally picked cherries, strawberries, raspberries, and blueberries from the farm. In the afternoon, fresh cakes, and strudel in the alpine hut (à la carte for a fee). The kitchen in the mountain restaurant at the Lodge Oberhauserhütte is open from 11:30 am to 5:30 pm. Four-course meals with daily salad and cheese buffet. Every week, culinary theme evenings according to the season. The motto of host and chef David Leitner: Tyrolean classics meet Mediterranean modernity: The food selection presents a new interpretation of local dishes and is enriched with Mediterranean delicacies and international specialties. Fantastic location at 1730 m in the heart of nature with stunning views of the Rodengo and Luson Alp and a marvellous Dolomites panorama. Completely traffic-free, absolutely quiet location. All rooms and suites with private balcony or garden terrace. Harmonious room and colour design. Furnishings with high-quality materials, such as furniture custom-made by the local carpenter and wooden floors. Fast Internet, room safe, flat screen TV with satellite programs. Desk, spacious closet, luggage rack. Free parking space for your vehicle directly at the hotel. 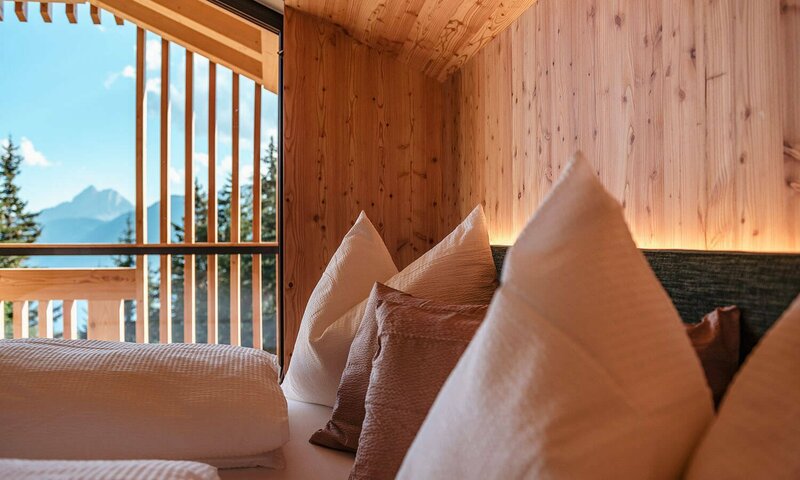 The Cima Lasta Suite and the Luson Alp Suites are equipped with an infrared sauna. On arrival or departure transfer to the train station Fortezza, for small fee. Holiday without using your car and yet mobile: The bus stop is only 600 meters from the Lodge Oberhauserhütte. 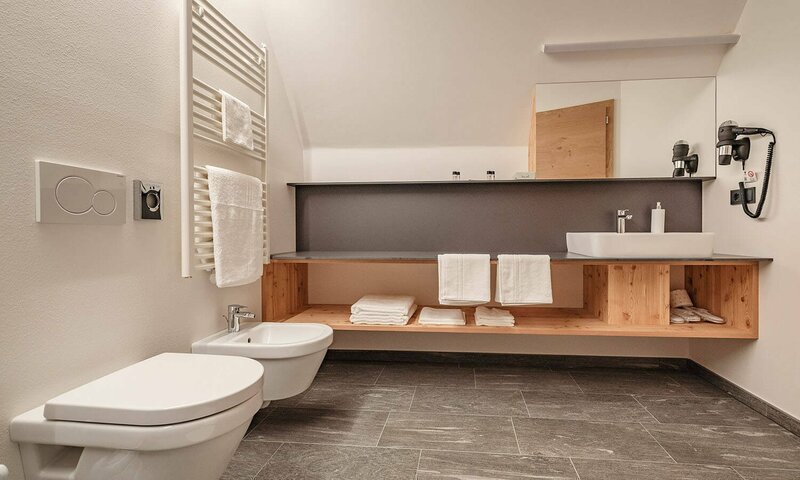 The Lodge Oberhauserhütte is an ideal starting point for all hiking and biking tours on the Rodengo and Luson Alp. From the house, it’s only 70 meters to the main hiking trail on the Rodengo Alp. 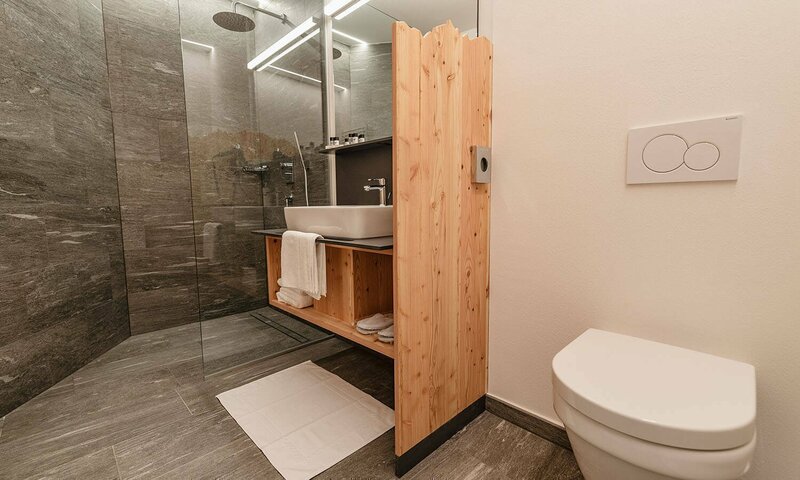 Fully equipped, lockable storage area, where hiking boots, mountain equipment and bicycles of our guests can be stored safely and conveniently. Each room has its own locker. From June to September, daily free admission to the natural swimming pond in the mountain village of Luson. 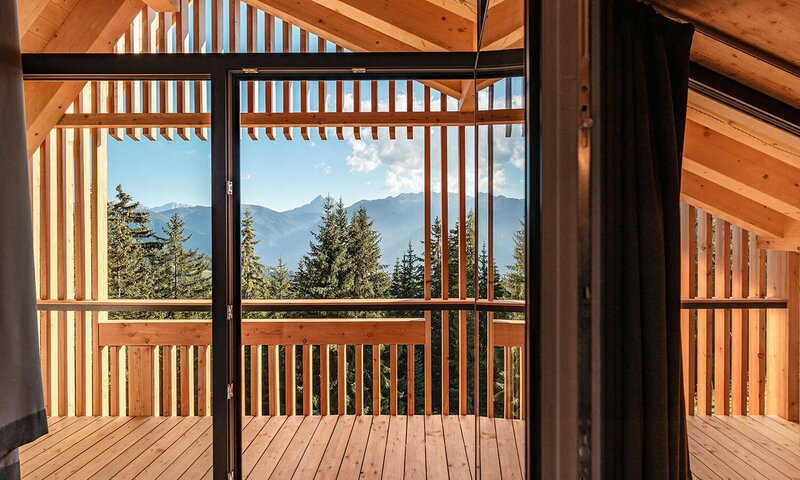 The Lodge Oberhauserhütte is the perfect place for a “pit stop” on the Transalp Route Munich-Venice. Paragliding and horse riding possible nearby. Wildlife watching and photo safari: In the twilight, deer and stags from the forest appear on the nearby meadows at the edge of the forest – an unforgettable natural spectacle! 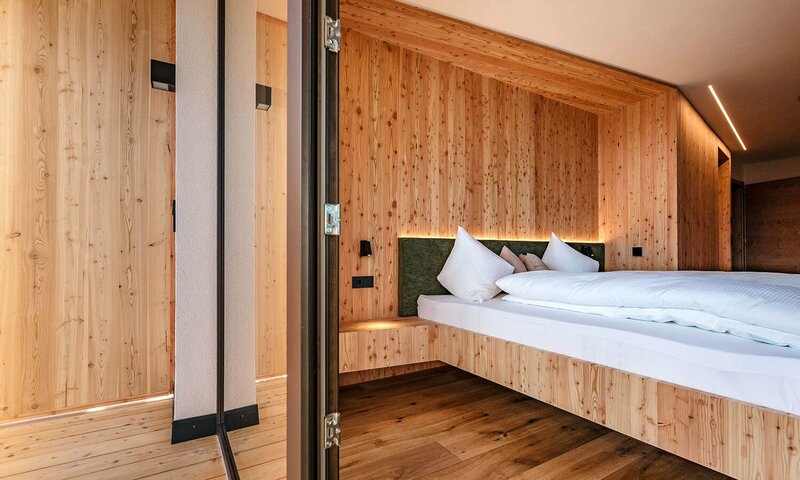 At the Lodge Oberhauserhütte, you are surrounded by nature, but if you need some action: in just 20 minutes you may reach Rodengo or Rio di Pusteria, and in 30 minutes you are in the tranquil bishop’s town of Bressanone. Numerous interesting destinations and attractions in the area all year round. The best tips from Thomas and David for your personal hiking and biking tours. Well-prepared winter hiking trails for beautiful walks in breath-taking scenery. Cross-country trails in pleasant levels of difficulty, entry in front of the house. Tobogganing on the farm’s private meadows directly by the lodge. Toboggan run on the Rodengo Alp. 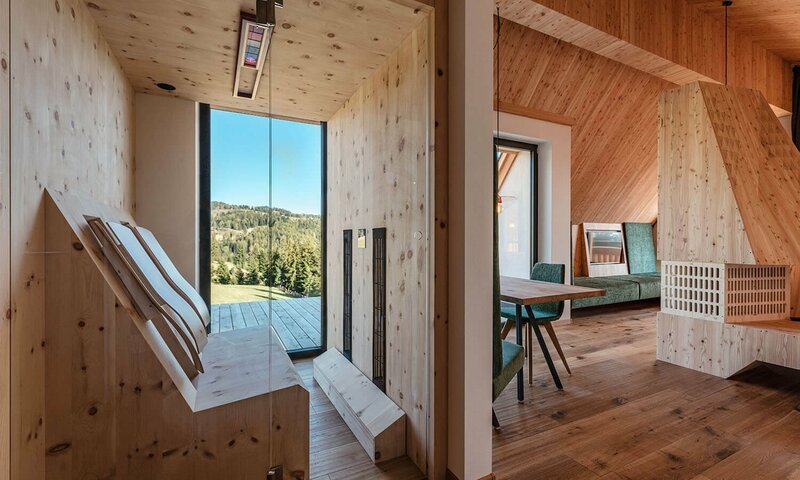 Heated and lockable hiking room with possibility to store cross-country skis. Weekly mulled wine party by the campfire. 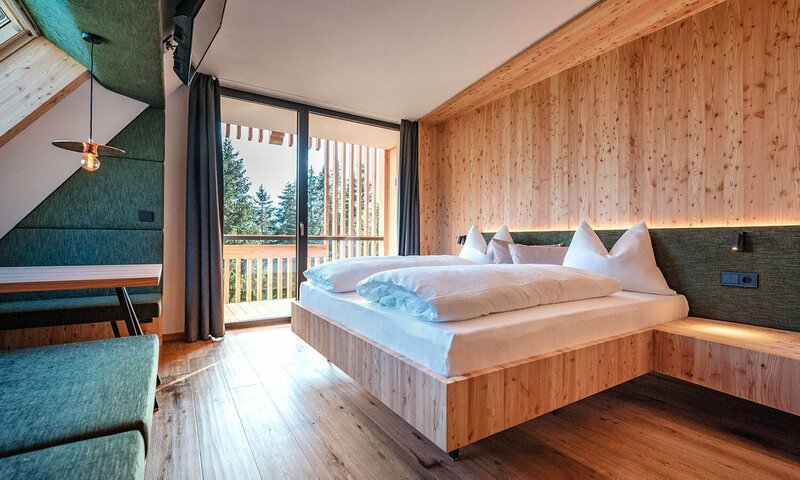 The indicated prices are in Euro per person and day in a double room or in a suite with half board (breakfast buffet and four-course evening meal) including all-inclusive services of the Oberhauser Hütte, for a stay of 5 nights. For short stays we charge a small surcharge of € 4,- for 3-4 nights and a surcharge of € 8,- for a stay of 1 to 2 nights. Most room categories are not bookable with pets so that all guests and especially allergy sufferers can feel comfortable with us. Your pets are also welcome in the particularly suitable rooms (25.00 € per day, without food). To fix your room reservation we ask for a deposit per person by cheque, bank transfer or via the internet via our homepage: “Click to pay”. Expenses incurred will not be covered by us. Important: We can only confirm your reservation once we have received your deposit. You can pay on site conveniently with a credit card or debit card (Visa or Mastercard) or even comfortably in cash. Since January 2016, in Italy is no longer allowed to pay amounts of more than 2,999.99 euros in cash. On arrival day, we expect you starting from 14:00. In case of a delay, we look forward to receiving a message from you. Departure: On departure day, please leave your room not later than 09:00. Other times are possible upon request. You may cancel your reservation until 30 days prior to arrival without any cancellation fee. Cancellations are only valid in written form. You may cancel your reservation not later than 30 days prior to arrival without any cancellation fee. In the period between the 30th and the 15th day prior to arrival, we will charge 40% of the total price. In case of a cancellation until 8 days before your arrival, we will charge 60% of the total price. In case of a cancellation less than 8 days before your arrival, we will charge 80% of the total price. If the guest does not arrive (no show), the total amount will be charged for the entire booked stay. In case of an early departure, the full booked stay is charged. For the purposes of the GDPR, we inform you that your data will be used and saved exclusively for processing your application and will not be disclosed or distributed to third parties. Regarding data processing, you are entitled to all rights according to the GDPR. The holder of the rights is Thomas Leitner – For more information about your rights, please visit here.